For anyone who has come to the world of action games only recently, Darksiders is a Zelda-like action-RPG that was released in 2010 and received a graphical, 4K facelift in 2016 with the Warmastered edition. Although it flew a bit under the radar when first released, Darksiders has continued to grow in popularity and the release of Darksiders 3 this year is probably what triggered the port of the original game to the Nintendo Switch. Unlike the recent Switch port of Dark Souls which suffered from a significant graphical downgrade, Darksiders Warmastered Edition generally looks fine on the handheld, although it lacks the 4K resolution that the PC and console edition boasted. With a colorful and more cartoonish aesthetic, the game has a timeless, World of Warcraft-like ability to not look too far behind the curve. And really, playing Darksiders on handheld is the only rationale for picking this up as the PC and current gen console editions look much better. But graphics aren’t everything and Darksiders on the Switch handles well, with fluid controls and a camera that generally helps rather than hinders. The player character, War — one of the Four Horsemen of the Apocalypse — runs, jumps, climbs and leaps with ease and in combat and I never felt frustrated by the controls as I did with the Dark Souls port. Darksiders Warmastered Edition is a 15-hour game with a great deal of environmental and enemy variety, and I was impressed with how well it handled throughout. Beyond that, the rest of my caveats are more with the game itself. Action games — even the Darksiders franchise itself — have evolved in their ability to tell compelling stories with fully-realized characters. War’s journey through the world of apocalyptic, Old Testament characters and mythology to rid the world of demonic forces is ultimately a little threadbare, though voiced with gruff enthusiasm. No matter, it’s enough to drive the action forward and Chris Velasco’s symphonic score is still impessive. Although it adds nothing unique and makes some visual concessions to fit the platform, Darksiders Warmastered Edition is a great way to revisit what is now considered a minor classic of the action-RPG genre. 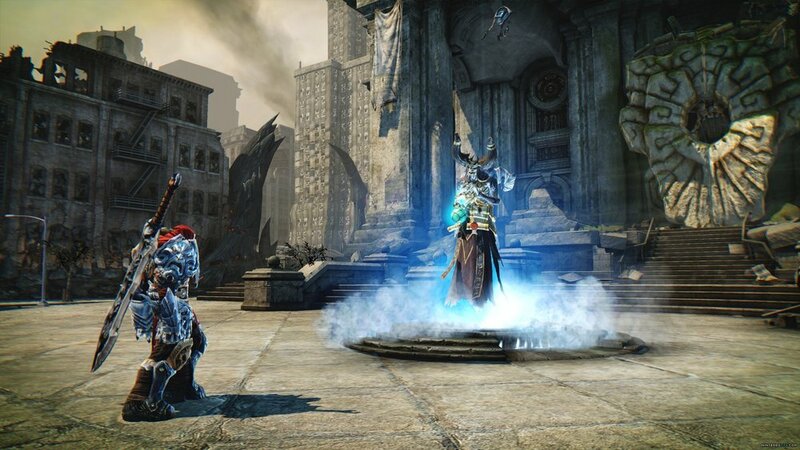 With fluid combat and a dramatic, if skeletal story, Darksiders has retained most of the fun-factor that made the game stand out way back in 2010. Playing the game on a big screen in 4K might be optimal, but Darksiders on the Switch is a decent alternative. Doom's great level design and near-perfect pacing shine through on the Switch, and moment-to-moment gameplay is still a blast to play, though the framerate drop and somewhat gauzy visuals may irk players used to other versions. There’s a chance that Trine: Enchanted Edition for the Nintendo Switch will be the first time playing the game for many, and they’ll find a fun and creative action adventure with puzzle elements, whether they’re by themselves or with friends. In spite of its uneven difficulty, Tales of Vesperia: Definitive Edition is an easy recommendation for fans of JRPGs. Its world is large, combat is varied, and solid pacing makes it an easy game to digest – especially from the comfort of the Switch's handheld mode. Sometimes, genre-gene splicing produces messy monstrosities, and sometimes it produces something unexpectedly interesting. In the case of Hell Warders, we’re looking at the progeny of the action-RPG genre infused with the DNA of tower defense. Toss in the visual aesthetic of Dark Souls, and you have a game salad that works pretty well.